And it's going to go right through the areas that are already under water. Poor souls, they just aren't getting a break. Well at least they can say that they did not receive an apology from that Chris something or another for the inaction. You just KNOW that Tesco are going to be better-organised and useful than anything Cameron does; they established a delivery system to the marooned areas some time ago. He's not much of a practical 'doer' is he? More of a 'dreamer' type? What, as in dreaming that taking selfies at memorial services for statesmen somehow makes him look big and clever? Did you ever see that movie Flood? Where a series of weather events and human incompetence led to London being flooded? The Met Office's head forecaster, Keith Hopkins, mistakenly believes the storm will head towards Holland and is guilt-ridden after Professor Leonard Morrison proves that the approaching surge of water will break through the Thames Barrier and flood central London. Leonard had focused his life around the belief that the barrier was built in the wrong area, to a bitter man. I read they had closed the Barrier, Bonny. It was contained in an article of pass the buck on this ongoing insanity. ETA; Was wondering if it could be overwhelmed, in which case it could have catastrophic consequences? The military has been drafted in to build up emergency barriers against fresh flood risks as rising river levels move eastwards across the southern UK. One hundred Royal Navy engineers have been extending a sandbag barrier in Datchet, near Windsor, Berkshire, along the River Thames. Fourteen of 16 severe flooding warnings - where there is danger to life - have been issued for the Thames Valley area as the already swollen river is predicted to burst its banks in several places between Didcot and Shepperton Green. 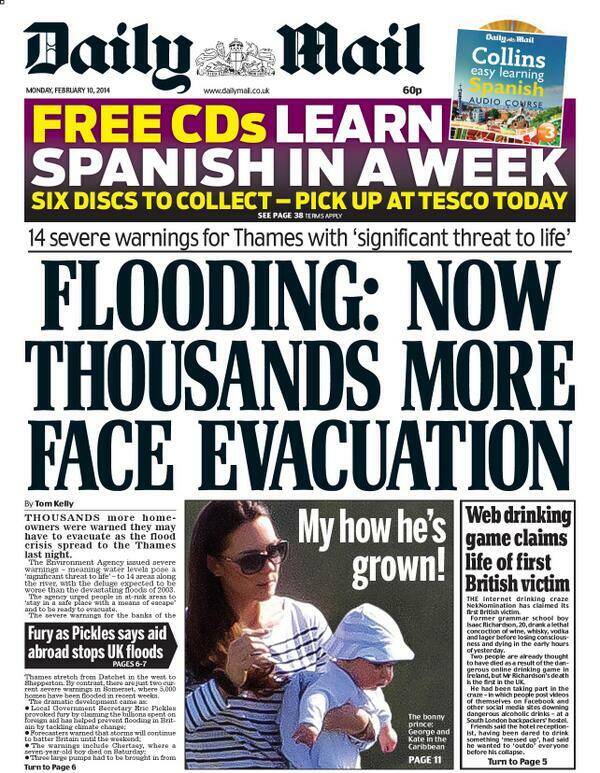 The consequences are incalculable if it starts spreading into south-east England. And the Westminster government was warned that the military were overstretched. But hey, what hasn't this useless shower been warned about and not listened? Bonny, have been reading about that as it must be extremely worrying. That's what makes people like him incompetent. This is just the latest in a long stream of disasters by Cameron and co, Lily. Remember how long it took any of them to react to the London riots a few years ago? Oh yes. That seems like eons ago too. In the early 60s I once drove around Shepton Mallet in the middle of the night with two kids and a Pekinese in the back of the car. I was on my way down from Scotland at the time. Pitch black out, I was sitting in water and the dog nearly drowned due to me panicking. God knows how I kept the car going. Pure fear I suspect. I recommend Cameron takes heed of the very distraught Ms Burrows; the Tory heartlands are now underwater, but they, too, have been left on their own. I don't blame people for not leaving their homes; even in rural Somerset, empty homes have been looted by scumbags. So what do the geniuses at the top think is going to happen in densely-populated areas? 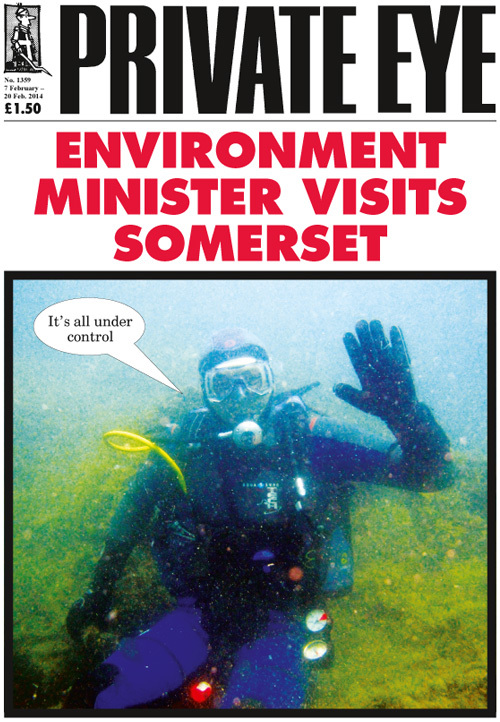 Private Eye have nailed it, as the often do. What a mess! They just plain don't know what to do. How can they justify not using some of the foreign aid money, for the people who actually pay it, for once? It's utter, total, institutional incompetence from where I am sitting, Lily, and the roots of it go very deep into the Westminster government. Cameron and co's priorities have never been with people who actually get their hands dirty producing food, or essential goods, but with his smarmy, crooked chums in banking, etc. That fish has well and truly rotted from the head. 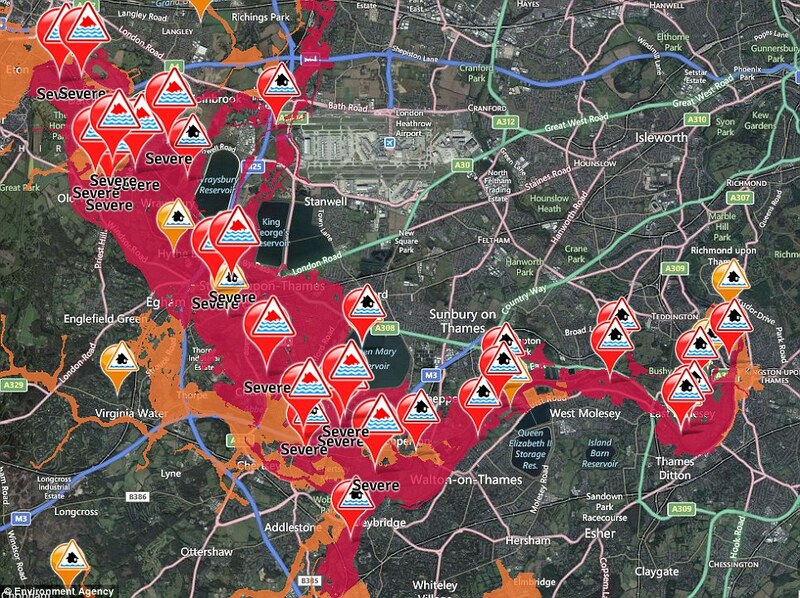 Look at what's going under water now - and how close Heathrow is to the danger area. Awful. I can hardly believe this is happening. Government needs some business men amongst their midst. A good business man, preferably with some engineering background could have really helped. They get things done. They could not have stopped the rain but could have made a significant difference in the consequences. After reading what some of the buffoons have said, like that Chris Smith guy, they really don't know what they are talking about, and they are paid for this? He should be fired and that's just one of them. Saw that, Sabot. When Heathrow is deluged, that will be an even more major headache for the government. Can you imagine the depth of anger there will be? Am watching some videos of the flooding. That is outrageous. So, money has been allotted to deal with aspects now. However, that does not absolve the previous inaction. I think they don't make politicians like they used to.